Browse pharmacy deals in the latest CVS Ad. As usual, CVS has offers to show on the new ad. The deals are valid starting on Sunday. Mucinex, Airborne, Halls, CVS brand medicines are either BOGO deals or they give Extrabucks Rewards for a certain amount of purchase. If you have difficulty in sleeping, you are on the correct address to strike a good deal with CVS Pharmacy stores. Are you annoyed with a runny nose or feeling cold even the temperature of your room is normal? 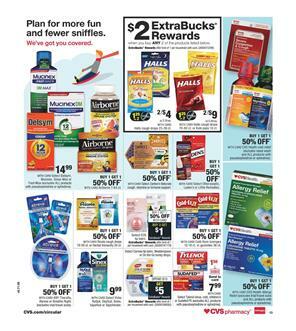 The simplest and quickest solutions are available on this CVS Ad Feb 10 - 16 Preview. However, always beware of what you use and get information from the professional medical workers. Don't act on your own ideas, remember that there is a school for medicine and thousands of people work hard to learn the human body. Using excessive amounts of medicines may break the immune system and it becomes even more vulnerable against harmful bacteria. We learn this every day with reminders from doctors. If you are sure to use these medicines, then use these deals to save on your health care needs. Some people regularly buy medicines so that CVS Weekly Ads are always offering a good deal on regular medicines. I am sure you will find your pills for a cheaper price or at least you can earn ExtraBucks rewards or save with BOGO deals. An advantage of shopping at CVS is knowing that you will get a $0 copay with your Medicare Part D Plan. Learn details on the official page related to the subject on CVS's website. Browse the deals on Tylenol, St. Joseph, Ecotrin, Bayer and more.